Happy Birthday to The Washington Post! 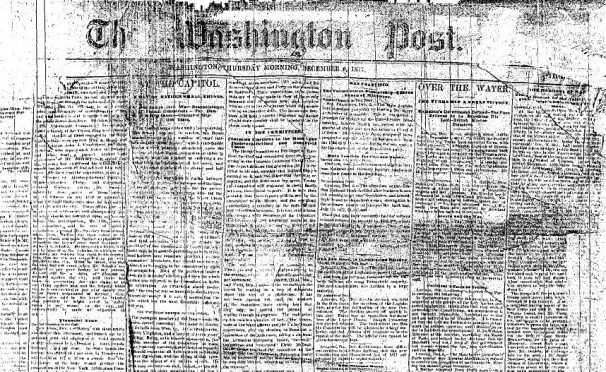 December 6, 1877 was a big day in local journalism as D.C.'s longest running local rag, The Washington Post, published its first issue. For three pennies readers got four pages of news. Sounds like a pretty good deal. The front page included bits from Capitol Hill (shocker) and updates about the USS Huron shipwreck, which had killed 98 officers and men off the coast of Nags Head, North Carolina a couple weeks earlier. The inaugural issue also included some breaking local items such as “the business along Water Street was very dull” and “an old bachelor died of the combined effects of cat-bite with his own folly.” Hard hitting stuff. There was also an acerbic editorial: “The brutal, corrupt and avaricious Government of Spain has been as powerless to crush freedom in Cuba as King George to suppress the lovers of independence in this country.” Pretty strong words. 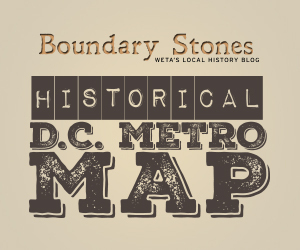 The paper's founder was a journalist named Stilson Hutchins who initially hoped to use it as a tool to advance the Democratic Party, though he later cut his allegiance to the Democrats. Among the journalists Hutchins hired in the early years was Joseph Pulitzer, who went on to become a pretty famous newspaper man in his own right. Pulitzer must've liked the Post's coverage of his wedding to Kate Davis in 1878. On June 20, 1874 DC delegates began to steal anything that wasn't bolted down in protest to news that President Grant had replaced them.